My wife and I recently traveled to Victoria, BC, for the weekend to celebrate our anniversary. We took our first seaplane on Kenmore Air for the outbound journey, and we returned on the Victoria Clipper so I could compare both options. I’ve traveled on a hydrofoil before between Macau and Hong Kong, which is about 1 hour. This experience was about the same except for the much longer travel time and more onerous U.S. border procedures. My largest complaint about the Victoria Clipper is not the boat itself but the ground experience. The ferry terminal is the furthest from the downtown core of Victoria (although still not a very far walk) and is a bare bones facility. The free WiFi barely worked. Most of my time was spent waiting in line to clear immigration, after which we were directed to a windowless warehouse to wait as each group was called for boarding. There is a food truck sitting in the parking lot if you want a meal before departure. I recommend you head next door to the restaurant in front of Days Inn. People joke about the “cattle call” of flying with Southwest Airlines. I thought this fit the term much better. It just wasn’t a pleasant way to spend an hour of my time, and we still hadn’t boarded. Do make plans to book early if you plan on taking the Victoria Clipper. Boarding groups are assigned by time of booking, not check-in, and will determine your ability to choose a seat on board. We were in Group 5 near the end and still able to find a pair of seats by the window. However, I saw other groups that were split up. The tray table was worse than useless. It was barely restrained by the latch, and it rested on my lap instead of above it. Once on board there was a cursory safety briefing, and we were asked not to leave our seats while the boat was near shore. But the commotion of boarding never really died down. Groups were talking loudly throughout, and attendants were walking through the aisles during the three-hour trip to take snack orders and distribute duty free catalogs. It wasn’t awful, but think of it like visiting a busy Starbucks. Don’t expect the usual calm of an airplane or even a Washington State Ferry. Our seats were the biggest issue for me. There is almost no legroom under the seat in front of you, which explains why they are so strict about the size of carryon bags. It’s for your own good. I saw plenty of people who were taking bigger bags than ours on board; I don’t know where they put them. Imagine a bulkhead seat for every passenger not sitting at a group table. Though not all seats had power, I did see a few standard 110V AC outlets along the windows and assume there were more in the center of the cabin. One last view of Victoria as we left the harbor. One bright spot was the observation deck in the rear. If you could tolerate the engine noise there is a small area on the top floor where you can go out to get a better view since ocean spray tends to obscure the windows. This is also where the luggage is stored in large freight containers. I never saw more than a half-dozen people outside. You were generally expected to stay in your seat for the entire journey since there wasn’t much else to do. I like to move around, so I elected to go buy my own food and beverages from the commissary (instead of the agents in the aisle) in addition to visiting the observation deck. A variety of food and alcoholic and non-alcoholic beverages were available at prices and quality similar to most airlines. They did charge for coffee ($2.00), but it was good quality stuff from Caffe Vita and came with unlimited refills. The journey was uneventful, and the water was very smooth after we cleared the Strait of Juan de Fuca. Do keep an eye out for cruise ships. They leave a huge wake, which caused our boat to lift up and down for about a minute on two separate occasions. Once we arrived at Seattle we were asked to exit in two separate groups. First, everyone with carryon luggage was allowed to leave. The rest of us with checked luggage needed to wait until it was removed, and even then there was some time spent waiting outdoors on the pier. Make sure you bring your jacket with you! Once the line started moving it was pretty quick. Bags were lined up along the queue to see the customs officers. “Did you buy anything?” No. Off we went to find an Uber. I wrote yesterday about my outbound journey with Kenmore Air and said that I would prefer to book the entire trip with them in the future. I’ll explain why. Our fare on the Victoria Clipper was a little more expensive ($109 per person) than normal because we booked one-way travel. It’s possible to pay just $187 for a round-trip fare, or even $149 for buying a round-trip fare seven days in advance. There are also a couple dollars in fees added to these base fares, and it seemed most people paid extra for food and beverages on the boat. Compare this to our travel on the outbound portion with Kenmore Air. They charge $162 from Seattle to Victoria and $180 from Victoria back to Seattle — a total of $342 per person. These are prices I saw when I booked my trip a week in advance and also when I’m searching today for a hypothetical trip three weeks in the future. So Kenmore Air is definitely the more expensive option. Despite the difference in price, I still prefer Kenmore Air. Both services have their strengths and weaknesses when it comes to comfort and scenery that seem to balance out. Kenmore Air offers a bird’s eye view and comfortable waiting area in exchange for a cramped cabin. 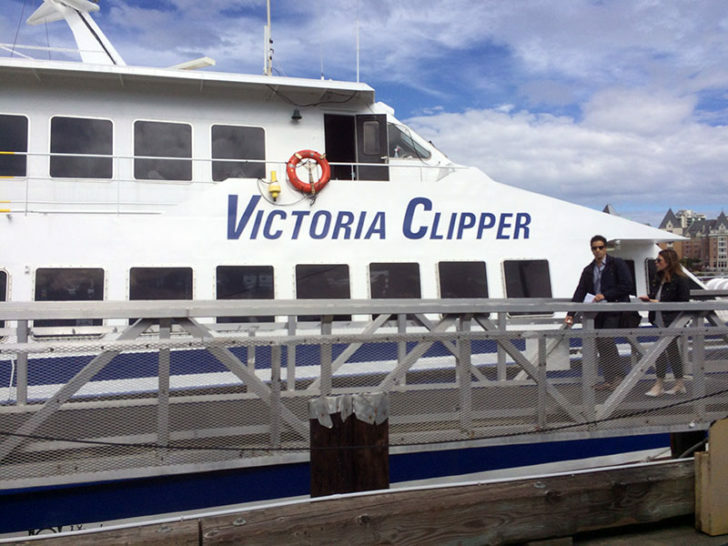 Victoria Clipper offers a ocean views and a more spacious seat even though it’s not impressive on land. These differences may boil down to personal preferences. But our journey on the Victoria Clipper just took so much time. I estimate that for $150 more you can save six hours on a round-trip journey to Victoria when you choose Kenmore Air instead of the Victoria Clipper. Ultimately that is the most compelling argument for me to travel with them in the future.